This episode we’re sharing the secret origins of our intrepid Four-Color Fanboys! Brian and Al step into their mental wayback machines to look at the very first comics they read, and how those comics turned them into lifelong comic book fans and shaped them as human-type people. The Hulk! Superman! Power Pack and the New Mutants! And lotsa lotsa Spider-Man! 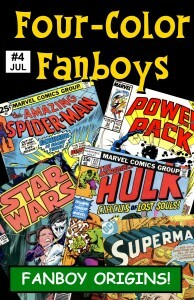 Join the Fanboys on a trip down memory lane in this all-new Four-Color Fanboys podcast!